What makes the human brain so powerful is the formidable ability of its basic unit, the neuron, to integrate information from myriad sources. Every neuron receives nerve impulses from several thousand other neurons. Some of these impulses are excitatory and tend to trigger another impulse in the neuron. But others are inhibitory and reduce the probability of a new impulse being triggered. Small potentials are generated in the neuron’s dendrites and cell body as a result of the neurotransmitter’s binding to its synaptic receptor. The passive diffusion of these receptor potentials (their intensity diminishes with distance travelled) results in the summation of their excitatory and inhibitory effects. It is at the neuron’s implantation cone (the point where the axon emerges from the cell body) that the result of this summation is decisive. If the sum exceeds the neuron’s excitatory threshold, a new nerve impulse will be generated and will travel down the axon. But if the sum remains below this threshold, no nerve impulse will be sent to the next neuron. The following animation shows one possible scenario for communication between neurons. Click on “B” and “C” to see two others. Contrary to receptor potentials which propagate passively while losing speed, the nerve impulses generated at the base of the axon, also known as action potentials, propagate actively with no signal loss. An action potential can propagate down a non-myelinated axon at speeds as slow as 0.5 metres per second. In contrast, the saltatory conduction that takes place in myelinated axons allows a potential to travel at speeds of up to 120 metres per second (over 400 km/h)! That is why your brain can communicate with your big toe in a few hundredths of a second. Axons often have an insulating sheath that lets nerve impulses travel faster. This sheath is made of a fatty substance called myelin, which consists of glial cell membranes wrapped around the axon. The myelin of the neurons in the brain is composed of oligodendrocytes, while that of the neurons in the peripheral nervous system is composed of Schwann cells. 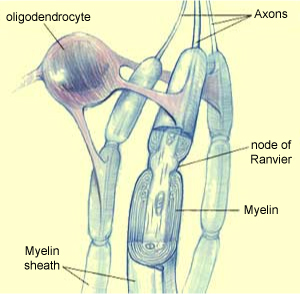 The myelin sheath does not cover the entire axon; it leaves small sections uncovered. These small exposed sections are called nodes of Ranvier. They are spaced from 0.2 to 2 millimetres apart. The reason that the myelin sheath speeds up neural conduction is that the action potentials literally jump from one node of Ranvier to the next. In fact, these nodes are the only places where the ion exchanges that generate the action potential can take place. This process is called saltatory conduction (from the Latin saltare, meaning “to jump”), as opposed to the much slower, continuous propagation that occurs in non-myelinated axons. Myelin thus saves both considerable space and considerable energy.